Download Darkest Dungeon (2017) for Mac OS. Popular challenging dungeon crawl video game with psychological stresses of adventuring. developed and published by Red Hook Studios. Languages: English, Russian, German, Czech, Russian, etc. 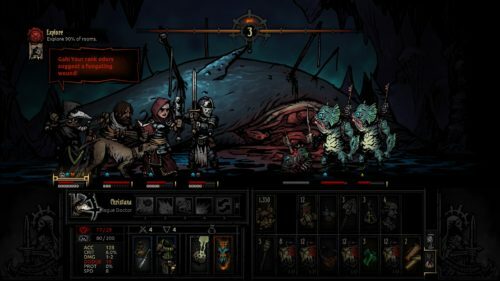 Darkest Dungeon is a party-based dungeon exploration game that basically simulates what would happen if real people were forced to delve into a real dungeon infested with real monsters. Sure, maybe you come out of it with a bag full of gold or some cool treasures, but you’ll probably also have some deep psychological scars to deal with, or at the very least a nasty drinking problem. — 16 (and counting!) 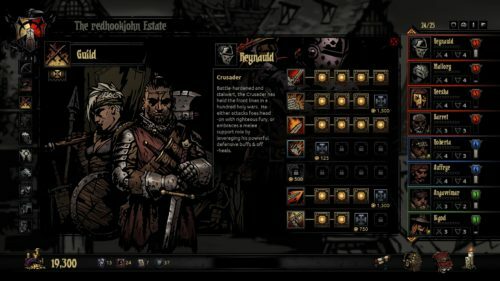 playable hero classes, including Plague Doctor, Hellion, and even the Leper! — Camp to heal wounds or deliver inspiring speeches. — Rest your weary, shell-shocked characters in town at the Tavern or the Abbey to keep their stress in check.